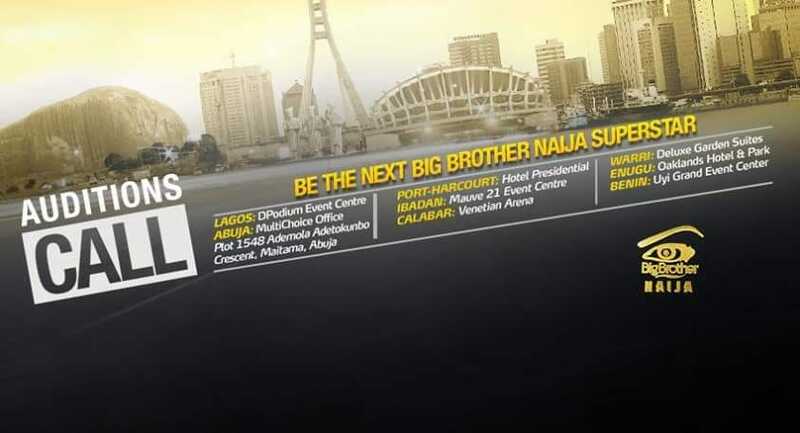 The Big Brother Naija 2019 Audition is already around the corner. We bet most people interested in participating are currently apprehensive but the goodnews is; the audition process is much simpler than you think. Although highly competitive, the process has always been as simple as possible. As with other years, this upcoming season should definitely be very simple. However, any candidate that wishes to go for the audition requires optimal preparation. The audition date for Bbnaija 2019 has been announced and it’s slated to hold on the 1st and 2nd of February, 2019. - In the first place, you must be a Nigerian. The show is explicitly for Nigerians. - You must be an adult. At least 21 years old. - Fluency in English is compulsory. - A valid international passport is compulsory. - No electronic gadgets are allowed in the house. - You must not have been convicted of any crime by a court of competent jurisdiction. - Members of secret societies are banned from participating. The Bbnaija 2019 application process is totally FREE. No purchase of forms, no registration fee or whatsoever, However you must be willing to appear at the audition venue in person and travel to wherever the show demands. - Be honest with your profile: One reason for the disqualification of a lot of applicants last year was provision of inaccurate or misleading information. - First, know the objectives of the show, and present your answers in line with that. When asked a question like why you want to be on the show, first of all think of why the show was created in the first place. Next, you present yourself in line with the objectives. Something like you know the show is most importantly to entertain viewers, and as well give a platform to entertainers to build their brand. Tell them how entertaining you are, what and what your fans will love you for. Go ahead to let them know the big plans you have for the future. Do not forget to include the direct impact BBNaija will have on your career. - Confidence is key: Bear in mind that your body language speaks louder than the words you speak. You don’t want to look timid to the members of the panel. So, try as much as possible to add some humor to your answers. Make sure you exhibit confidence. - Smile: Show positive energy. Of course, nobody wants to watch a depressed fellow. - Entertaining Profile: Build a profile from the standpoint of entertainment. No one really cares about all the big schools or the number of jobs you’ve done. Except of course there is something spectacular about it. - Show what you will bring to the show: When asked look at yourself, and think up your skills and entertainment qualities. Also talk about the great projects you are working on achieving after the show. - Read Beyond Big Brother: Know your immediate environment. You might be surprised on how some simple and unrelated questions can help. - Have a Good Social Profile: Having a good social profile on social media is an added advantage. To further assist you in yout preparation, here are the possibly asked questions in Big Brother Naija auditions. - Why do you want to be on the show? - How did you learn of the show, and how long have you watched? - Why do you think you deserve to be on the show? - What are your strategies if selected, and what is it? - What is your drive in life? - How would you react to people who have contrary views to your beliefs? - If successful, do you have any plans after the house? - Who is your favorite ex housemate and why? - How do you see the Big Brother Naija show? If you were to suggest improvements, what would it be? We believe this post will aid as well as arm you with what you need to know and expect during the audition. However, if you have any question, or would like to participate in the show please indicate in the comment section. If you found this post useful, encourage us by liking and sharing to others.